If you're noticing dampness or trickling on your basement wall, you can rest assured that you're not alone. Homes all across the country experience dampness, leaks or even flooding in their basements due to poor construction, the test of time, or both. Dampness in your basement or on your basement wall is often an indication of a breach in the moisture barrier of your home. If you're experiencing leaking or seeping of water into your basement, you'll want to get the problem fixed as soon as possible. Water leaking into your basement can cause all sorts of damage that can be time consuming and expensive to repair. Water damage has a cumulative effect, too, meaning that the longer you wait to get it fixed the more likely you are to experience structural rotting in your home, a drastic reduction of air quality, and several other adverse effects. Waterproofing your basement does not have to be difficult. We are absolutely dedicated to identifying the cause of your wet basement and fixing the problem for good. 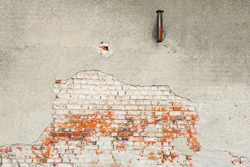 If you're noticing a drip or dampness on your basement wall. The term water damage, plainly enough, covers all of the different types of damage than can occur from prolonged exposure to moisture and water. Water can have serious, far reaching effects on your basement wall, floor or even your ceiling. The effects of water on your furniture, boxes of stored goods, books, carpet and more are pretty clear, but the ill effects don't stop there. Water vapor from leaks in your basement wall can condense on parts of your basement that may not otherwise have been effected. Condensation can cause considerable water damage to your ceiling and even the joists of your first floor in the form of crumbling drywall, rotting wood, peeling paint, buckling or bubbling flooring, rusting pipes and much, much more. A moist environment also encourages the development of mold and mildew growths as well as fungus spores which drastically reduce the air quality of your home and contribute to respiratory infections, fatigue and other health problems. Avoiding water damage is all about prevention and taking fast action if any signs or symptoms are noticed. If you notice any moisture on your basement wall, don't hesitate to give us a call! Most homes are built to prevent water from seeping into their basement by waterproofing the portion of the house that's underground. Waterproofing often includes applying tar or other sealants to the exterior of the basement wall and floor. Sometimes these initial steps are sufficient, but in rainy or humid environments the moisture barrier may breakdown over time due to constant exposure to water. There are many factors that contribute to basement leaks. If the yard of your home is inclined towards your house on any side of your home, drain off water from rain and snow will flow down your yard and pool next to your house. Dense shrubbery or tree coverage in your yard can reduce exposure to the sun, thus reducing evaporation and contributing to a waterlogged yard. basement wall or floor, and take care of it immediately. Waterproofing your basement avoids damage to your home resulting from excessive moisture or dampness. Not only will you avoid chipping paint, rotting structural components, crumbling drywall and other unsightly damage, but you'll also prevent the growth of harmful molds and mildews that could affect your health. Don't wait to waterproof your basement; you can have another clean, dry, usable and beautiful room in your home faster than you think!